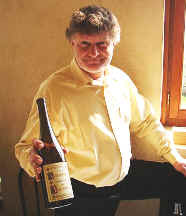 Assembling a set of a single vintage of Gewrztraminer wines from Alsace would take several years of collecting samples. Part of the "problem" is that local importers have radically differing sales and purchasing protocols. This means the importer of one winery may be selling the 2002 vintage while another is just buying the 2000. So a group of "currently available" wines was assembled, covering a range of vintages. The wines are all from grower whose names will be recognized by those who dabble in Alsatian wines. The names may be unfamiliar to those who know the prominent large properties such as Hugel and Trimbach. 8th Place: MARTIN SCHAETZEL 2002 "Cuve Rserve"
This wine suffered from being Wine "H" in the line-up and it followed, for those tasting alphabetically, a much richer wine which had some sweetness. This did not display sugar, being a mildly fruity wine. It has a light grapefruit aroma and flavor, but it tasted very light following the Deiss wine which was a monster. Not flawed, merely light and dry. I gave this a half to one star rating on my three star scale, no stars being an ordinary wine. 7th Place: CHARLES SCHLERET 2000 "Herrenweg"
This was really exceptional for my taste! The wine was a factor or two more fruity and floral than any other wine in the tasting. The spice notes are incredibly intense. It's rather dry, but not bone dry on the palate. The flavors are deep and unmistakably Gewrztraminer. You'll find tons of rose petal notes in the flavor of this remarkable wine. I gave it a two star+ rating. Very fine. 6th Place: MARC KREYDENWEISS 2000 "Kritt"
The aromas are mildly varietal and spicy, but a bit quiet. There's some sweetness on the palate and the wine is fairly big on the palate, partly due to a bit of sugar. It's round and pleasant. One star. What this wine lacked in spice it made up for in freshness and fruity aromas. It's youth and vitality were most attractive, though it may be missing a note of spiciness. Fairly dry. Good wine. One-and-a-half-stars. 4th Place: DOMAINE WEINBACH 2002 "Rserve Personnelle"
I liked the intensity of the Gewrztraminer in this wine, but felt the nose was marred, somewhat, by a mushroom element. The fact that the nose wasn't perfectly 'clean' was bothersome for me. The flavors are good, solidly Gewrz, but the nose is a bit odd. Still, it's worth a one star rating. 3rd Place: MARC TEMP 2000 "Zellenberg"
This wine displays a lovely nose of spice and citrus and the grapefruit notes really shine brightly on the palate. The wine has nice intensity and is fairly deep. One star+. There's a bit of appley fruit to this faintly floral Gewrz, but the wine delivers far more on the palate than it does on the nose. It's also one of the sweeter wines of the tasting, coming close to being a dessert wine compared to the few dry offerings here. One-and-a-half-stars. 1st Place: MARCEL DEISS 2000 "Saint Hippolyte"
This wine finishing first was a surprise to me as the nose shows more leesy and yeasty notes than bright fruit or spice. You have to look for the spice tones behind all the smokiness. The wine is certainly moderately sweet and big. It's honeyed, big, powerful and spicy on the palate. I gave it a one-and-a-half star rating.